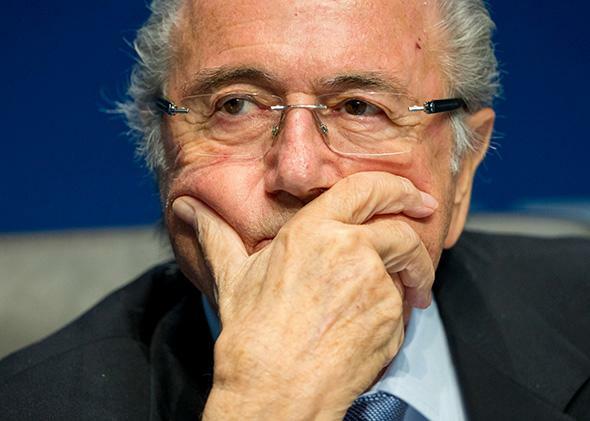 FIFA arrests: Sepp Blatter’s organization might actually go down thanks to the U.S. Justice Department’s indictments. The American justice system could actually bring down mighty FIFA. FIFA President Sepp Blatter looks on during a press conference at the end of the FIFA Executive Committee meeting at the FIFA headquarters on March 20, 2015, in Zurich, Switzerland. On July 4, 1988, at a hotel in a suburb of Zurich, the executive committee of soccer’s governing body, FIFA, awarded the right to host the World Cup to the United States. The country was a fútbol backwater. Its last pro league—the one that had imported Pele, Franz Beckenbauer, and other aging international stars—had folded four years earlier. Its men’s national team hadn’t qualified for a World Cup since 1950; stocked with collegians, it was on the cusp of being eliminated from regional qualifying for the 1990 tournament. Its women’s national team, hastily assembled three years earlier, had played just a handful of games. The dizzying day of dawn arrests at a five-star Swiss hotel on Wednesday, a 161-page indictment detailing hundreds of millions of dollars in bribes and kickbacks, and aggressive pronouncements by top U.S. law enforcement officials of more to come reflects just how right that Brazilian was. The economic might of the United States in international soccer has indeed been realized: American sponsors, broadcasters, marketers, and apparel companies have funneled billions of dollars into the game; a pro league is thriving; millions of Americans watch European matches on television; and hundreds of thousands will attend European exhibition games on U.S. soil this summer. But the soccer cronies who have fed at the revenue trough didn’t anticipate the consequences of courting all that American money: It gave America the power to bring them down. It’s no sure thing that Wednesday’s events are a deathblow for FIFA, the Fédération Internationale de Football Association. The tentacular, underregulated, filthy rich bureaucracy was founded in 1904, when eight European nations agreed to cooperate in organizing international matches. In the past 40 years, FIFA has survived a string of corrupt and arrogant executives, and scandal after scandal. Its offices have been raided; its business partners have stood trial; and its members have been purged for bribery, embezzlement, kickbacks, vote-buying, and other malfeasance. It has alienated women by advocating tighter shorts and making them play this summer’s Women’s World Cup on artificial turf; it has suggested that racism in soccer can be solved with a handshake. And then there’s the matter of FIFA slaves. The question now, though, is whether the U.S. government’s unparalleled legal action will be fatal. FIFA’s defensive spin began immediately. It announced that it had “banned provisionally” 11 of the 14 men named in the indictment—including some who already had been kicked out of soccer—and praised itself for taking “swift and immediate action.” Its Teflon president, Sepp Blatter, whose all-but-certain re-election to a fifth term remained scheduled for Friday despite calls from European soccer officials for a delay, went a step further. In a statement posted on FIFA’s website accompanied by a huge photo of him looking deep in thought, the 79-year-old Blatter said the U.S. and Swiss investigations “will help to reinforce measures that FIFA has already taken to root out any wrongdoing in football.” As if the U.S. government was just following FIFA’s bold lead. But seeing a fraud and racketeering conspiracy depicted neatly and clearly in the ominous font of U.S. legal documents makes you feel that perhaps even FIFA—masters of the haughty brush-off and grandiose, empty phrase—can’t talk its way out of this one. Sure, there will be thousand-dollar-an-hour attorneys and jurisdictional complications and epic grandstanding. But the U.S. government thought enough of the case—and its public-relations and practical ramifications around the world—to invite reporters to watch a bunch of sports lackeys perp walk behind bedsheets and then deploy the attorney general, Loretta Lynch, and the head of the FBI, James Comey, to lay out the charges. The indictment alleges bribery in the awarding of the 2010 World Cup to South Africa, in Blatter’s 2011 re-election campaign, and in the 1996 sponsorship of Brazil’s soccer federation by a “Sportswear Company A,” which clearly appears to be Nike. (Nike said it is cooperating with the investigation.) Others involved include the current and former presidents of CONCACAF, the regional soccer federation, of which the United States is a member, and sports marketing executives with deep ties to U.S. soccer. One of those is Aaron Davidson, the American CEO of second-tier men’s pro league NASL and president of Traffic Sports, a marketing firm that purchased the rights to all CONCACAF events. The indictment states that the soccer officials solicited and received “well over” $150 million in bribes and kickbacks in exchange for the rights to market events like the Gold Cup and the Copa América Centenario, a bicontinental championship to be hosted by the U.S. next year featuring such historic soccer nations as Brazil, Uruguay, and Argentina. Not mentioned in the indictment is Sunil Gulati, the current president of the U.S. Soccer Federation, who replaced Blazer on the FIFA executive committee in 2013. Gulati has advocated reform, including pushing for the release of a FIFA–commissioned report by a former U.S. attorney on corruption in the awarding of the 2018 and 2022 World Cups to Russia and Qatar, respectively. After the United States lost the 2022 vote, Gulati said he was against bidding again until the process was cleaned up. Swiss authorities opened their own investigation into the Russia and Qatar bids, seizing documents and data from FIFA headquarters in Zurich and seeking FIFA executives who voted for questioning. Gulati is a 55-year-old economics lecturer at Columbia who has worked for U.S. soccer since the 1980s. I’ve known him for almost two decades. He’s smart, direct, deliberate, and pragmatic. (In Johannesburg in 2010, he told me about his 50-year plan for American soccer; we’re more than halfway there.) While critics have called on the United States and European soccer powers to boycott the World Cup or bolt FIFA altogether, Gulati has worked to slowly gain influence from within. He recognized that the United States had been dismissed as a soccer nonentity for decades, and that the perception wasn’t going to change until its men’s team improved and the sport grew at home. Both of those things have happened. The American men aren’t yet a genuine threat to win the World Cup, but disdain for U.S. soccer—as an on-field opponent and as a place to generate revenue—declines every year. I don’t know what Gulati’s relationship with Chuck Blazer was like, or whether Gulati advocated aggressively for change as FIFA’s scandals mounted, or whether he had anything to offer investigators. But I’d like to think that he, and others in U.S. soccer, had been hoping for this day for a long time. Because the biggest, most dramatic, and most credible move against corruption in the world’s most popular sport wouldn’t have happened without the rise of the game in the United States. It’s not how most fans envisioned it happening, but the U.S. is finally a soccer power.